Ronald Ashley Rothwell was born in Liverpool on the 14th October 1912 and was educated at St Anne's Church of England School in the Stanley area of the city. Ronald worked for the Liverpool Corporation in the Passenger Transport Department and lived before the war in Bibby Street, Old Swan. Sgt. 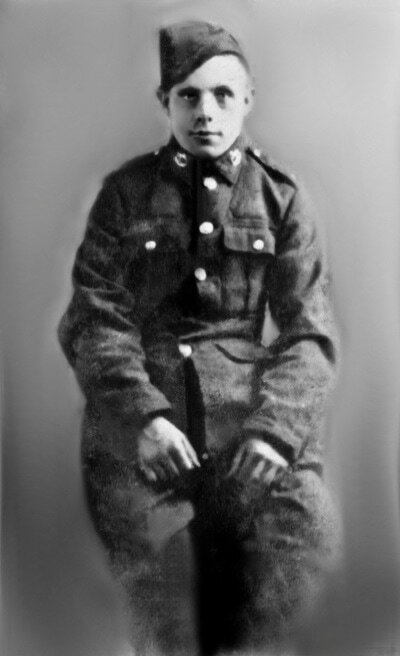 Rothwell enlisted into the British Army, joining the 13th Battalion of the King's (Liverpool) Regiment at their first formal barracks at Jordan Hill College in Glasgow. 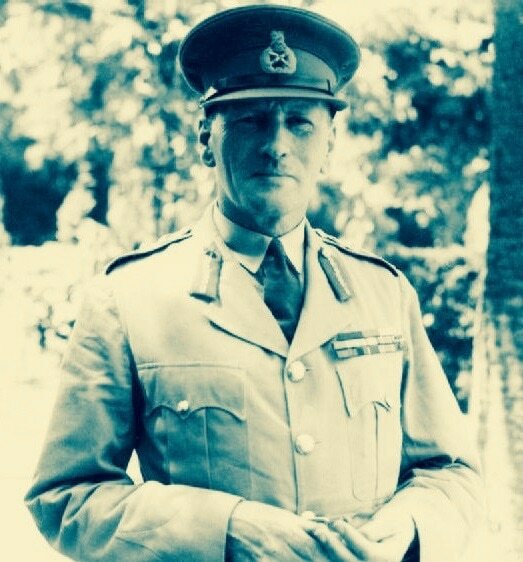 By the time the 13th King's were posted overseas to India in December 1941, Rothwell had been promoted to the rank of Sergeant. 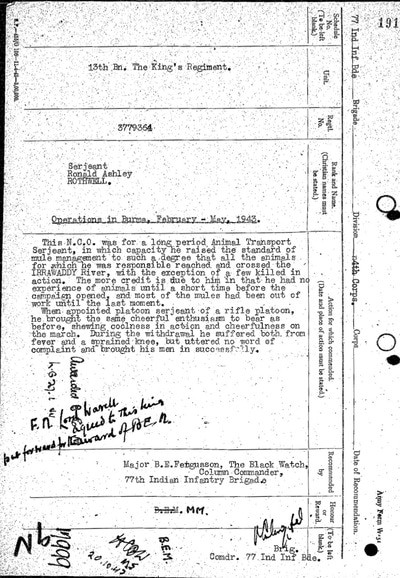 Working within A 'Company of the battalion, he became a popular NCO with both officers and men alike. The King's settled down at Secunderabad, where they performed various garrison and policing duties in the locality. As history now knows, in mid-July 1942, the battalion were chosen to form the British infantry element of the newly raised 77th Indian Infantry Brigade under the command of Brigadier Orde Charles Wingate. 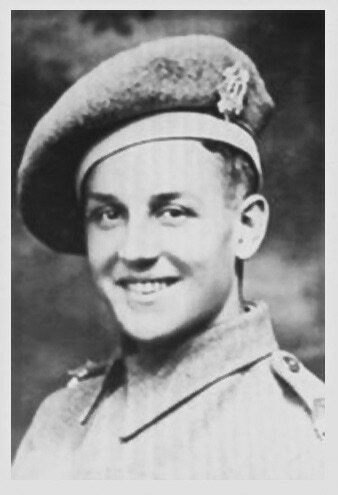 Ronald Rothwell began his time with the Chindits as a Rifle Platoon Section leader under Lt. George Borrow, but was soon transferred to work as the Animal Transport Sergeant within 5 Column, firstly under the leadership of Captain Ted Waugh of the King's, but later commanded by Major Bernard Fergusson of the Black Watch. Sgt. Rothwell proved an invaluable addition to the column with his skills in handling the mules and horses soon becoming apparent to the officers in charge, Lts. W. Smyly and W. Roberts. ​Up at the head of the column marched Duncan Menzies and I and John Fraser; behind us came Cairns, the ideal Serjeant-Major, in temperament as much as efficiency; then came Peter Dorans; Rothwell the Animal Transport Serjeant; L./Cpl. Lee the clerk; Horton the cipher operator, known throughout the column as Jimmy 'Orton; Foster and White, the two Signallers; Serjeant Skillander an Irish ex-jockey and spare Serjeant in Column Headquarters; and finally Brookes the bugler. They were a witty and cheerful lot, and John, Duncan and I were often in fits of laughter at what we overheard from just behind us. Rothwell, a calm, efficient man, with an excellent sense of humour, led all the singing; his two favourites, sung every night, and often two or three times a night were: I’ve got a Sixpence, Jolly, Jolly Sixpence, and When Johnny Comes Marching Home Again. Not long into the expedition, Lt. William Roberts, known to all in 5 Column as Gerry, was asked to revoke his role in Animal Transport and head up one of the Rifle Platoons. On the 3rd March, he asked Major Fergusson if he might take Sgt. 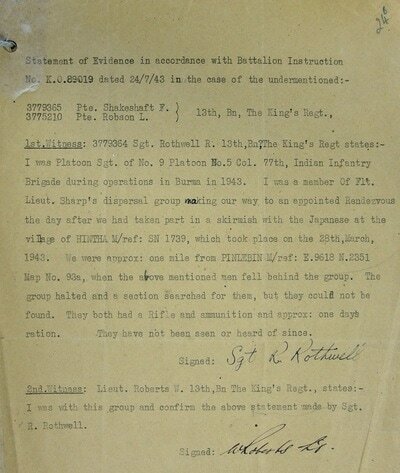 Rothwell as his second in this platoon and this request was granted. From this moment on, the fate of these two soldiers would be intrinsically linked. Gerry Roberts' unit often worked ahead of the main body of the column, scouting out new tracks and trails, and testing the trustworthiness of the villages encountered along the way. They were heavily involved in 5 Column's first skirmish with the Japanese at the hamlet of Kyaik-in, close to where Fergusson's men were to deliver their demolition of the Myitkhina-Mandalay railway at Bonchaung. The crossing was good on the whole, but I felt most uncomfortable in the little boat I was in. I am sent down stream with a part of my group to blow up a River Steamer. We had a hot reception on landing at the East Bank. Japs opened up with 4inch mortars and machine guns from their position on the beach. Got over this ok and marched on about four miles to where Captain MacDonald had recce’d a bivouac area. Wingate's decision to take the majority of his Brigade over the Irrawaddy River proved with the benefit of hindsight to be a mistake. During the third week of March and with dispersal in mind, 5 Column were given orders to create a diversion for the rest of the Brigade, which now found itself trapped in a three-sided bag between the Irrawaddy and Shweli Rivers to the west and north and the Mongmit-Myitson motor road to the south. 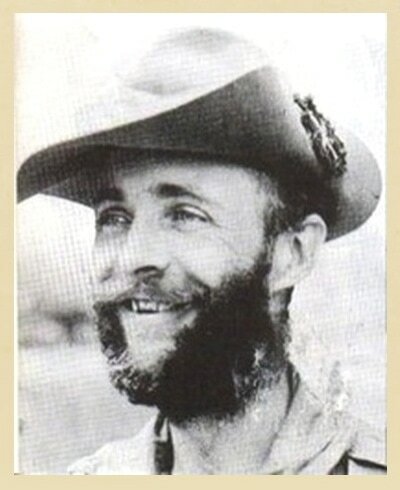 Wingate instructed Fergusson to "trail his coat" and lead the Japanese pursuers away from the general direction of the Irrawaddy and in particular the area around the town of Inywa, where Wingate now hoped to re-cross the river. After a battle lasting several hours, Major Fergusson withdrew his men from Hintha and led them away towards a pre-arranged rendezvous point some two miles or so to the northeast. 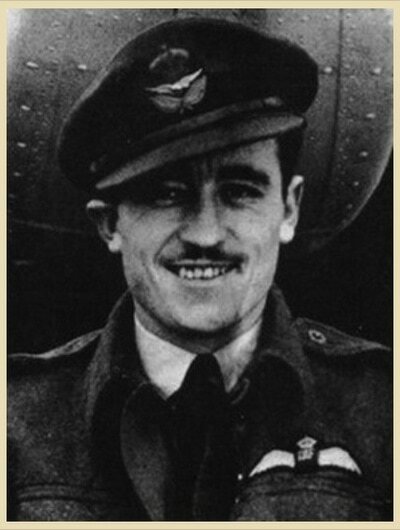 Here he met up with the rest of his unit, who under the command of Flight-Lieutenant Denny Sharp, the column's RAF Liaison officer, were waiting for their commander's return in a dried up river bed or chaung. Disastrously, as the reacquainted column marched away from the chaung it was once again attacked, this time by a large Japanese patrol which had been tracking Fergusson's men since their withdrawal from Hintha. Over one hundred men were cut adrift from 5 Column at this juncture. In one witness statement provided by a survivor of Operation Longcloth, Sgt. 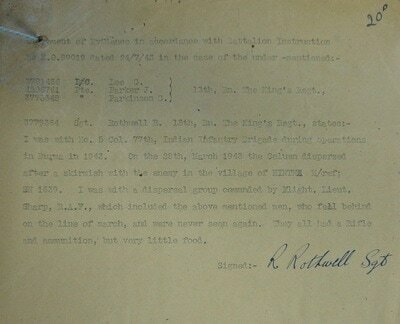 Rothwell was rumoured to be amongst those lost at the ambush. However, further mentions in both Bernard Fergusson's book and the diary of Gerry Roberts, prove this rumour to be untrue. Seen below are some of the men mentioned in this narrative so far, please click on any image to bring it forward on the page. After another ten days of constant marching, in addition to a difficult and treacherous crossing of the Shweli River, the remnants of 5 Column reached the banks of the Irrawaddy once more. Major Fergusson divided his column into three dispersal parties of around 25 men in each, taking command of one group himself and appointing Denny Sharp and Gerry Roberts to lead another, with the last party under the guidance of Captain Tommy Roberts. 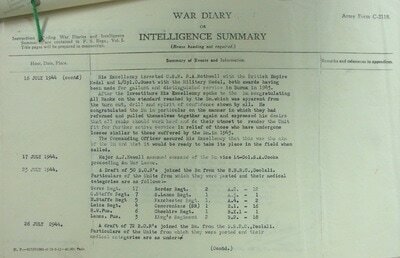 On the 10th April 1943, Denny Sharp, Gerry Roberts and Sgt. Rothwell, along with the rest of their party succeeded in getting over the river. It would take these Chindits another two weeks to make the journey back to India, often going without food or water for days on end and having to risk entering unfriendly villages in the hope of supplementing their meagre rations. 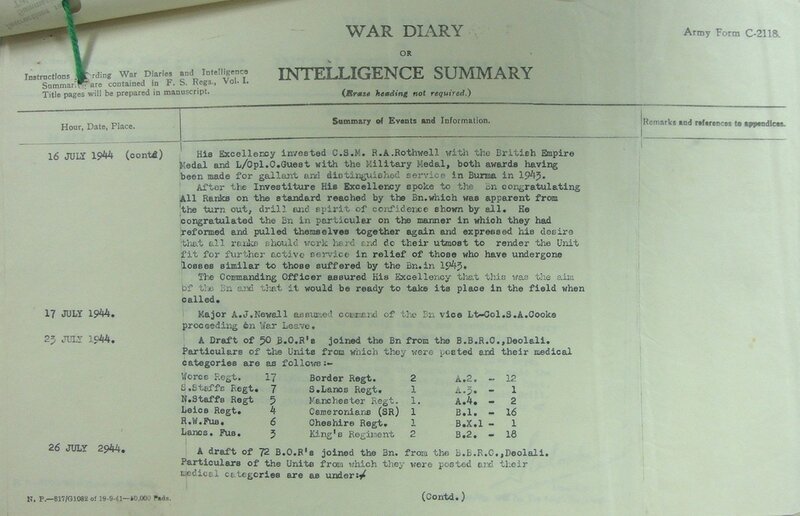 Denny Sharp's dispersal party re-crossed the Chindwin on the 24th April after bumping into a patrol of Seaforth Highlanders on the east bank. The Scots took them under their wing, feeding them bully beef and handing out cigarettes, before sending them on to Thanan for a wash, shave and much needed change of clothing. Most returning Chindits spent at least a few days at the 19th Casualty Clearing Station near Imphal, where Matron Agnes McGearey took care of their pains. After a period of rest and recuperation all men were sent back to their various regiments. Sgt. Rothwell rejoined the 13th King's, who were now stationed at the Napier Barracks in Karachi. I was with No. 5 Column, 77th Indian Infantry Brigade during operations in Burma in 1943. On the 28th March, the Column dispersed after a skirmish with the enemy in the village of Hintha. I was with a dispersal group commanded by Flight Lieutenent Sharp of the RAF, which included the above mentioned men, who fell behind the line of march and were never seen again. They all had rifles and ammunition, but very little food. 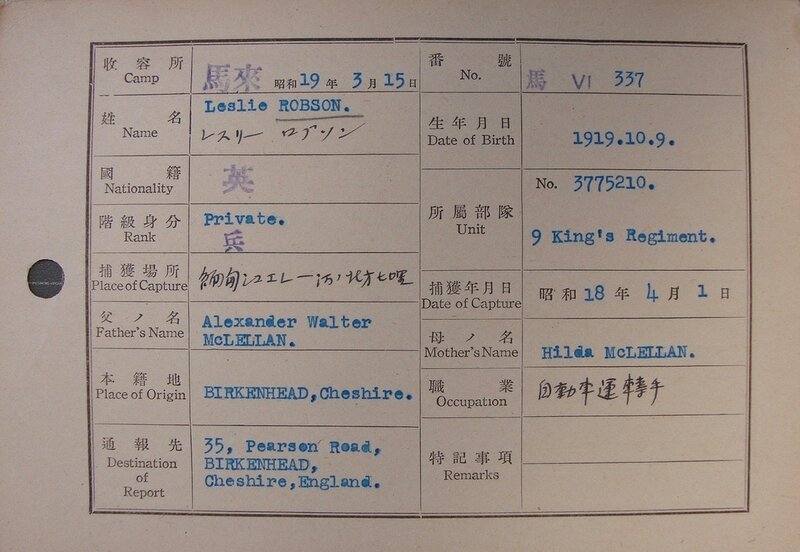 3781436 Lance Corporal George Lee from Manchester, was 5 Column's Cypher Clerk on Operation Longcloth. This soldier went missing from his unit after he tried to reclaim some cyphers, lost when a mule fell into a ravine. L/Cpl. Lee was also taken prisoner in 1943, but sadly perished inside Block 6 of Rangoon Jail on the 2nd September that same year. His POW number was 576 and he was buried at the English Cantonment Cemetery situated close to the Royal Lakes in the eastern sector of the city. 4206791 Pte. 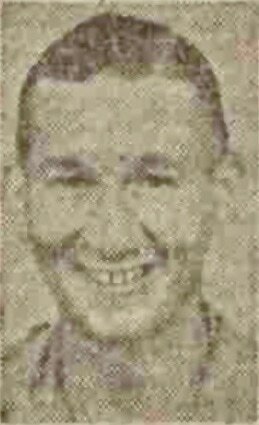 Jack Parker formerly of the Royal Welch Fusiliers and from Cotteridge in Birmingham, died in Block 6 of Rangoon Jail on the 22nd February 1944. 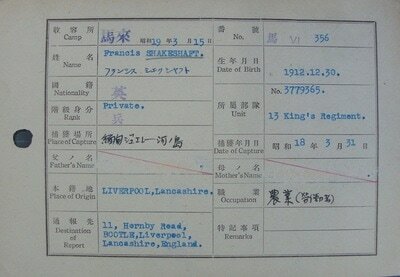 Jack had the POW number 506 whilst a prisoner of war and was buried in grave no. 158 at the English Cantonment Cemetery. 3773348 Pte. 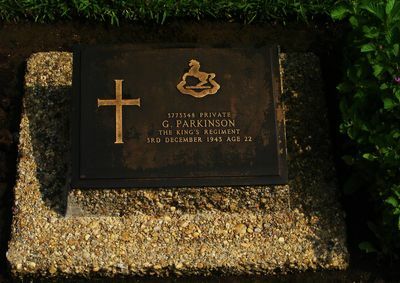 George Parkinson from Liverpool, perished inside Block 6 of Rangoon Jail on the 3rd December 1943 and was buried at the English Cantonment Cemetery in grave no. 99. 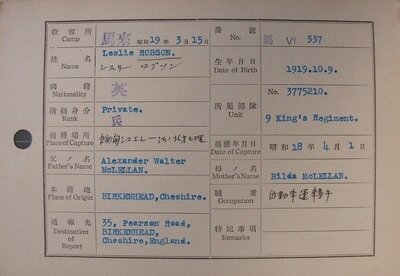 His POW number whilst held in Japanese hands was 520. All burials at the Cantonment Cemetery were moved over to the newly constructed Rangoon War Cemetery in early 1946. Shown in the Gallery below are Sgt. 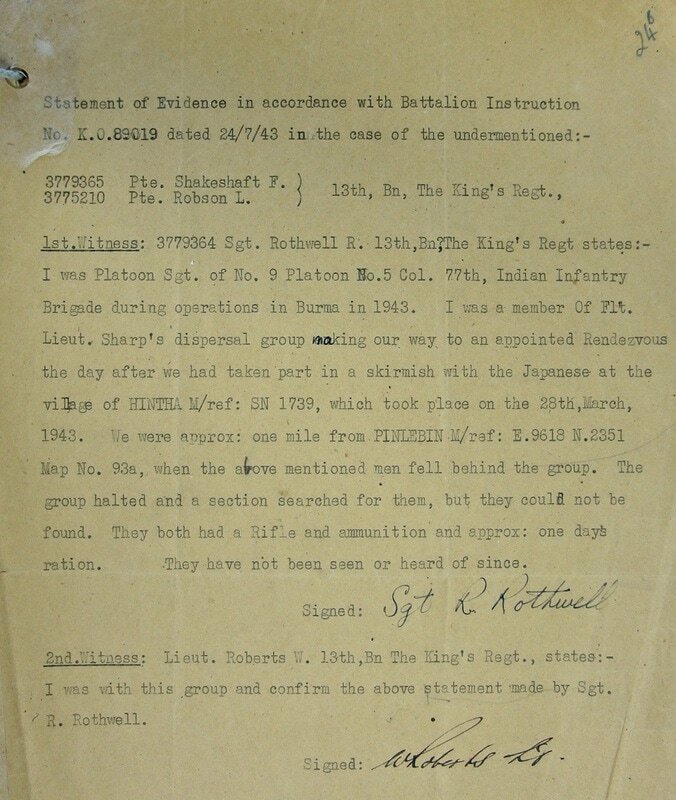 Rothwell's two witness statements, the POW index cards for Francis Shakeshaft and Leslie Robson and a photograph of Pte. George Parkinson and his grave at Rangoon War Cemetery. Please click on any image to bring it forward on the page. For his efforts during the first Wingate expedition, Sgt. Ronald Ashley Rothwell was awarded the British Empire Medal. This award was recommended by Major Bernard Fergusson via Field Marshall (Viceroy) Wavell and approved by the King on the 2nd February 1944, after the normal publication within the pages of the London Gazette on January 25th. Sgt Rothwell received his medal on the 16th July 1944, in a ceremony held at the Napier Barracks in Karachi. The medal was presented by His Excellency, The Commander in Chief (India), General Sir Claude J. E. Auckinleck, who was visiting the King's Regiment in relation to their role as part of the Karachi Defence Initiative. This N.C.O. was for a long period Animal Transport Sergeant, in which capacity he raised the standard of mule management to such a degree that all the animals for which he was responsible reached and crossed the Irrawaddy River, with the exception of a few killed in action. The more credit is due to him in that he had no experience of animals until a short time before the campaign opened, and most of the mules had been out of work until the last moment. Then appointed Rifle Platoon Sergeant, he brought the same cheerful enthusiasm to bear as before, showing coolness in action and cheerfulness on the march. During the withdrawal (from Burma) he suffered both from fever and a sprained knee, but uttered no word of complaint and brought his men in successfully. Recommended by: Major B. E. Fergusson, The Black Watch, No.5 Column Commander, 77th Indian Infantry Brigade. 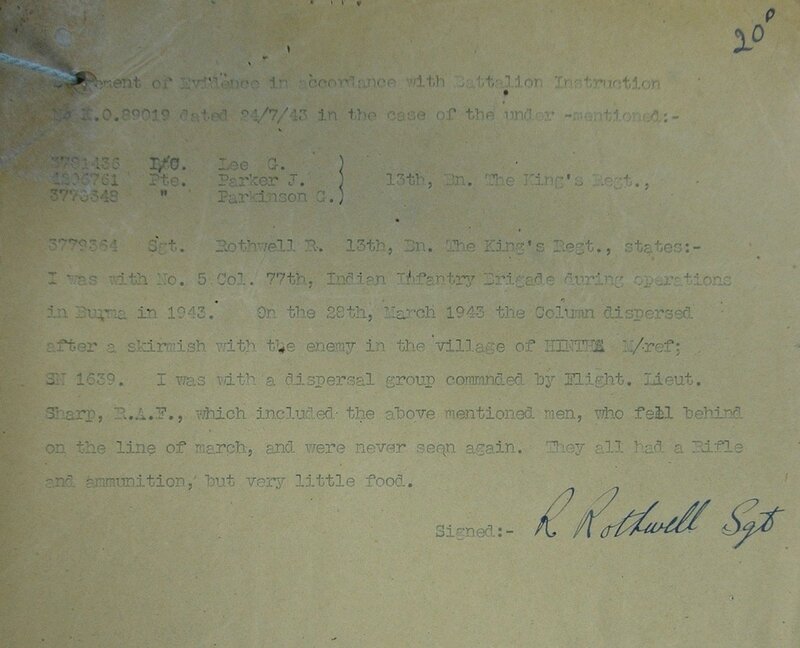 Signed by: Brigadier O. C. Wingate, Commander 77th Indian Infantry Brigade. 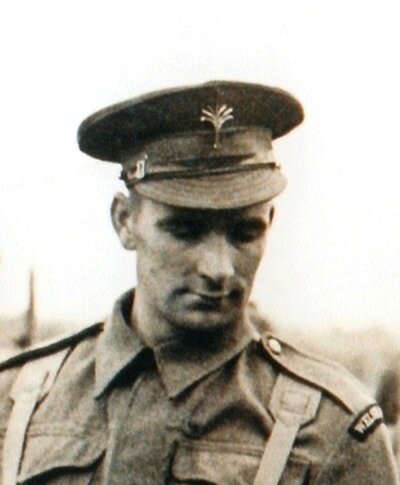 On March 25th 1945, having been promoted to Company Sergeant Major, Ronald Rothwell was chosen as second in command of a draft of men set for special duties at Comilla. This unit was to be led by Captain R. Wilkinson of the King's Regiment, who had also seen action in 1943 during Operation Longcloth. Seen below is a third gallery of images in relation to this story, please click on any image to bring it forward on the page. C.Q.M.S. 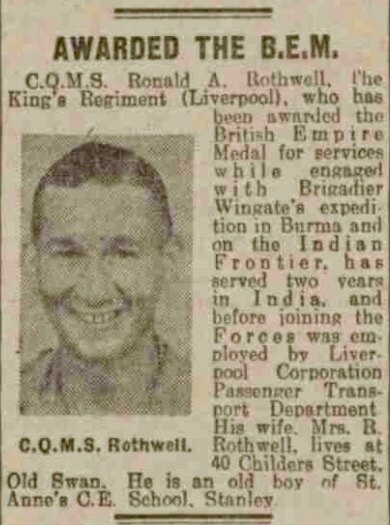 Ronald Ashley Rothwell, the King's Regiment (Liverpool), who has been awarded the British Empire Medal for services while engaged with Brigadier Wingate's expedition in Burma and on the Indian Frontier, has served two years in India. 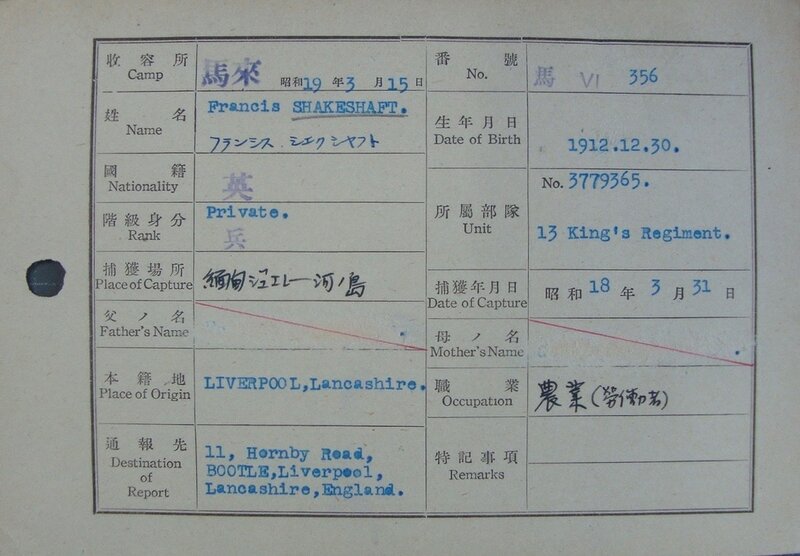 Before joining the Forces, he was employed by Liverpool Corporation, Passenger Transport Department. His wife, Mrs. Frances Rothwell (nee Collins), lives at 40 Childers Street, Old Swan. Ronald is an old boy of St. Anne's Church of England School in Stanley. ​This N.C.O. was for a long period Animal Transport Sergeant, in which capacity he raised the standard of mule management to such a degree that all the animals for which he was responsible reached and crossed the Irrawaddy River, with the exception of a few killed in action. The more credit is due to him in that he had no experience of animals until a short time before the campaign opened, and most of the mules had been out of work until the last moment. Ronald Rothwell died in the last quarter of 1985; for me his story is just another example of an ordinary Liverpool man, whose efforts and achievements during world war two, proved to be quite extraordinary. From a selection of photographs involving 5 Column and their dispersal in 1943, comes this image of Sgt. 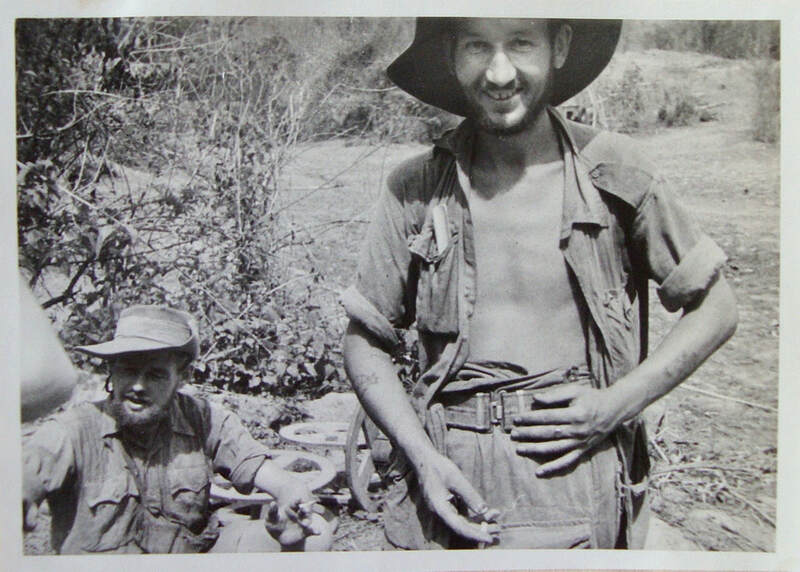 Rothwell and another Chindit safely over the Chindwin River and enjoying their first proper cigarette for many weeks. Sgt. Rothwell smiles for the camera, after reaching the safety of Allied held territory in late April 1943. Copyright © Steve Fogden, April 2017.